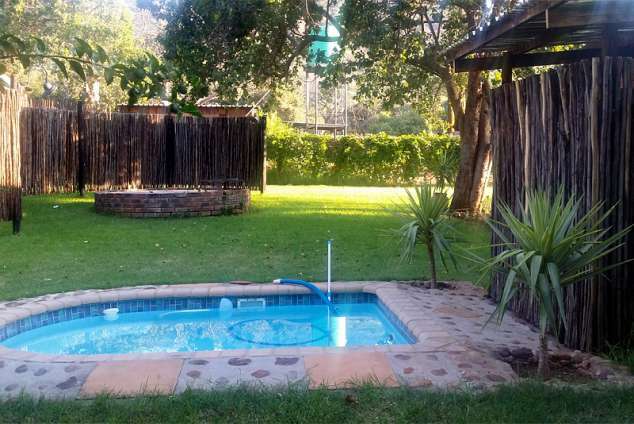 Comfy-Lee Cottage - Modimolle (Nylstroom) Accommodation. For a truly tranquil Bushveld experience on a working farm come and enjoy a stay in our refurbished fully equipped farmhouse. Birds and Wildlife including Zebra, Nyala, Kudu, Eland, Rooihartbees and Impala can be viewed from the verandah , on foot or by request, on game drives. The farmhouse has all the luxuries including being wheelchair friendly, fans, heaters, large fridge/freezer, stove and fully equipped kitchen. Lounge, dining area, kitchen and large wheelchair friendly bathroom with toilet and shower. The yard is fully fenced with a lovely garden with large lawns and trees. On the verandah there is an outside bar and dining area and outside shower. For braais we have a portable Weber and a large enclosed boma area. The cottage is self cater or on request meals can be supplied from our farm produced meat and vegies. Some of the attractions in the area include, lion, viewing and interaction, hot water springs, bird viewing all within a 30km radius. Is your establishment on a working farm? 8512 page views since 27 May, 2013. Last updated on 30 Oct, 2018.